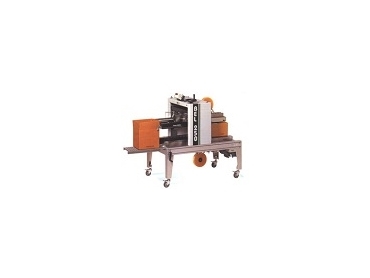 Wexxar BEL's BEL 250 automatic, pressure sensitive carton tapers. The Wexxar BEL BEL 250 supplied by Live Industrial is a fully automatic, pressure sensitive and tool-less carton taper that emphasises safety, ease of use and rugged construction. The BEL 250 assures squareness of taped cartons through its innovative Uni-Drive system that synchronises conveyor speed and eliminates case skew. Snap Folder flap-folding technology eliminates traditional flap kickers which can cause serious injury to staff and promote the use of expensive machine guarding. The operator is further safeguarded against injury as the BEL 250 carton taper features a magnetic motor starter that protects from accidental restarts after power interruptions and protects the motor against power overloads. DEKKA High Performance stainless steel tape heads are simply loaded in or out of the machine in 30 seconds or less allowing for superior tape application. Standard 2” tape heads are supplied with 3” tape heads available. Box size changes are easy to make and can be done from either side of the machine, taking 30 seconds or less. Maintenance and downtime are also limited by quick, open top pulleys that enable drive belts to be replaced in minutes. The BEL 250 carton taper is strong and sturdy, made from a high tensile anodised aluminium C-beam frame that is also corrosion resistant. The paint-free finish guards against paint contamination in case of peeling or flaking. Steady flow and throughput is guaranteed with BEL 250 carton tapers because of an adjustable timer and automatic case indexing.